1 a person who enjoys grocery shopping. 2 an iPhone program that likes to help with the grocery shopping. ORIGIN: early 21st century creation of Idle Loop Software Design, LLC. 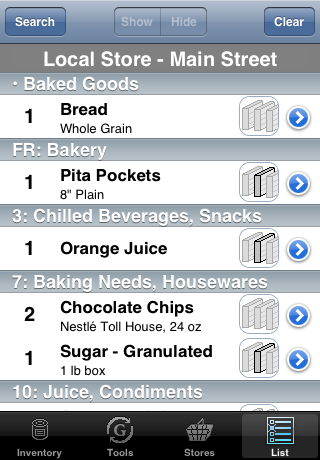 Grocophile is a highly customizable grocery shopping list application for the iPhone and iPod Touch. 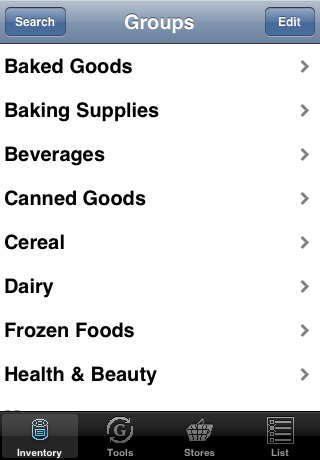 It allows you to quickly create your grocery shopping list, show your items grouped by category or by aisles in your favorite stores, and mark things off the list as you collect them. If you have more than one iPhone or iPod Touch device in your household, you can share grocery data and your shopping list directly via WiFi or through the Internet using Dropbox. The tutorial pages walk you through all of Grocophile's features with helpful tips about how to get the most out of your purchase. Even if you don't read the tutorials, be sure to check out the support page for valuable hints and tips for the best experience with Grocophile and how to ensure you don't lose your investment of time and effort customizing Grocophile. Keep up with Grocophile news and announcements through our Twitter feed. December 18, 2012 Grocophile version 1.4 is now available on the App Store. This version updates support for Dropbox and is now optimized for the 4-inch Retina display on the iPhone 5 and latest iPod Touch. Recent changes. November 2, 2010 Grocophile version 1.3 is now available on the App Store. This version contains support for MobileMe and Dropbox as well as a critical bug fix. Check out the list of recent changes. May 1, 2009 Grocophile version 1.2.1 is now available on the App Store. Check out the list of recent changes. March 12, 2009 Grocophile version 1.2 is now available on the App Store. Check out the list of recent changes. February 13, 2008 Grocophile version 1.1.3 is now available on the App Store. February 13, 2009 Grocophile version 1.1.3 is now available on the App Store. Check out the list of recent changes. February 2, 2009 Grocophile version 1.1.2 has been submitted to Apple. It should be available on the App Store soon, and will be a free upgrade to all Grocophile owners. Check out the list of bug fixes. Thanks to our users for their helpful suggestions. January 28, 2009 Grocophile version 1.1.1 is now available on the App Store. January 26, 2009 Grocophile version 1.1.1 has been submitted to Apple. It should be available on the App Store in one to three weeks, and will be a free upgrade to all Grocophile owners. Check out the list of bug fixes. Thanks to our users for their helpful suggestions. January 8, 2009 Grocophile version 1.1 was approved today and is now available on the App Store! January 5, 2009 Grocophile version 1.1 has been submitted to Apple. It should be available on the App Store in one to three weeks, and will be a free upgrade to all Grocophile owners. Check out the list of new features. Thanks to our users for their helpful suggestions and to our beta testers for helping us iron at the last few issues. September 17, 2008 Grocophile was approved last night and became available on the App Store this morning.